In Melbourne, Glasgow born singer Ruby Carter was known as the 'Godmother of Jazz'. Another great singer, Jane Clifton, was celebrant at her colourful, traffic-stopping funeral. This is a sad day. Usually I would say that we are here to celebrate a life – and there will be a celebration of Ruby’s life here today – but it is a sad day. Because it has come as such a shock. Ruby’s passing was so sudden. It’s almost impossible for us to imagine our lives without her presence in it. The streets outside are resounding with the silence of her absence. It’s eerie. It feels wrong. We knew she was ill.
She’d been battling illness, been in and out of cancer, for a year or so now. Long hard years of debilitating treatment that saw her in and out of hospital, but still managing to crack hardy, still managing to do gigs, still managing to belt out the odd song or three. This recent round with brain cancer did seem very serious indeed and she’d started to ask me about doing her funeral. Never an easy conversation to have. But we swung into action, started organising it anyway. Bernard Galbally managed to book the Espy for Feb 3rd next year, so, that we could do one last, magnificent Ruby Tuesday in honour of her long residency. I felt absolutely confident she would hang in for the gig. And, who knows, maybe we could keep that booking and hold a tribute for Ruby…. Even when I went to visit her on the day before she died and saw for myself how things weren’t going so well – she was really having a hard time – I somehow thought that this was a crisis she would pull through. Such was the size of her spirit, her indomitable presence. To say she was larger than life is to give life too much credit. She was born in Glasgow, and I’m not going to say what year she was born in or she might just jump out of that coffin and give me a Glasgow kiss. Ruby Carter was, is and always will be 45. Ruby was the daughter of Robina, known as Ruby, and Peter Waterson. They divorced and Ruby’s Mum went on to marry Sandy, when Ruby was 8 years-old. And it was Sandy who was really Ruby’s main father throughout her life. Sister of Bobby, Alex, Johnny and Joe – we are recording this for the family back in Glasgow, so, best wishes to all of you back there. Big sister to Geraldine – who is here today. Mother to Jerry …many of us here today were at her side at Jerry’s funeral in 1995 when he sadly passed away. She took that loss hard - but there was joy to be found as Granny to Jerry’s daughter, Jacqueline – Ruby’s grand-daughter – who is also here today. As is Jerry’s partner, Caroline. The family grew up in the area of Glasgow known as the Gorbles where they breed ‘em tough. Geraldine told me they were familiar with tinned spaghetti but she’d never seen real spaghetti until she the age of 5 when she saw Ruby, then aged 16, clock someone over the head with a packet of the stuff. The guy had put his hand where it should not to have been and he paid the price. Ruby attended St John’s Catholic school and later St Margaret’s Catholic School. She left school at 15 and worked in cafés and in the family fish ‘n chip shop, where she was given the responsibility of closing for the night. And when she did - she’d shut the doors, turn up the volume on the jukebox, and she and her friends would jive the night away. Back in those days folks all over the UK would spend their seaside holidays at Butlins Holiday Camps. Sports, swimming, beauty parades, bingo and live music were part of a great variety of activities on offer and the Camps employed huge numbers of staff. Ruby’s Dad worked at Butlins on the Ayreshire Coast and managed to get Ruby a job there, too, as a supervisor. When the singer with the live big band fell ill it was Ruby who stepped up to the mic, effortlessly singing standards with the band like she’d been doing it all her life. She sang at clubs around Glasgow including The Locarno Ballroom and The Stuart Hotel. She travelled back and forth to London, appearing as a support act to Tom Jones, Shirley Bassey among others. Geraldine remembers being one of only two audience members when Ruby did a first gig at the Lorne Hotel at the top end of Sauchiehall Street in downtown Glasgow. The audience built slowly over the next few weeks until a month later you couldn’t get in the door – the place was packed. She married Nicky Carter in 1957 and Jerry was born in 1958. But times were hard, the marriage didn’t last, and Jerry grew up at home with Ruby’s family. In 1972 Geraldine came out to Australia with husband Alex who was here to play soccer. They were going to head back home in a couple of years but the weather and the lifestyle out here won them both over – and Geraldine’s lived here ever since. Ruby came out to visit, nursing a broken heart – courtesy of ‘Big Robert’. She backed and forthed between here and Glasgow before also making the permanent move in December 1973. But despite all her experience she didn’t start singing here straightaway when she first arrived. Her head wasn’t in the right place and she didn’t really know any of the local musicians. She worked at the Chevron and the Fawkner Park Hotels, until little by little, she did get to know people – musicians gravitate towards each other like bees to honey and Ruby never had any difficulty making friends, starting conversations -- and, luckily for all of us, she did begin to sing again. and I’m grateful to Geraldine and her family for filling me in on the details - she seems to have sprung, fully formed, into my life as a singer of great note, maybe 30 years ago. I am part of her other family. This great bunch of people here today who knew her and loved her. The city of St Kilda where she lived and worked for the past 4 decades. Where she was a familiar and greatly loved local identity. Even before the arrival of the lethal mobility scooter she was a familiar sight on her bicycle. Always with a kind word or a ‘hello son’ ‘hello hen’ or a quick tongue lashing for all and sundry. Some people weren’t even aware that she was a singer, they just knew she was special. She ate at the finest restaurants on the block – Cicciolina’s, Lau’s Kitchen and, of course, Claypots – and they were so generous to her with their food and their love because they recognised a good soul. Then there were her sons, her Number One Sons. The title of Number One Son was a hotly contested honour and not bestowed lightly. You had to earn it. By – fixing a computer or tuning a TV, driving her to the shops or hospital, or simply playing your instrument like a god. On a technicality the Number One Son in perpetuity was awarded to Jex Saareladt. But Barney McAll is in fierce litigation over this claim. As is John McAll and don’t even start Stephen Hadley or Paul Williamson or Julien Wilson. Not to mention Bobbie Valentine, wee Dougie de Vries, Ben Robertson, Nick Haywood, Sam Lemann and….the list of 20 or so goes on. But I believe there is a special category for Russell Smith. I feel for the Number One Sons, no one will replace Ruby in their lives. And then there are the girls – all of us jazz girls, living in fear of the Godmother of Jazz, living in hope of her praise. How lucky we were, girls, to have Ruby in our lives to show us that you don’t stop singing. Age may weary us and fashion shift but while there’s breath and the sniff of a gig, you just get up and do it. She was the supreme performer, the supreme entertainer. When Ruby stepped up to the mic – and in recent years that would be a struggle – people would stop in their tracks. Who was this strange looking, incomprehensible woman in the red leather coat, beanie and headphones telling us all to ‘have a bit of shoosh!’? But bemused smiles would disappear when she began to sing and they realised they were in the presence of something, someone, special – that rare creature – a real singer. Music was her life. She lived and breathed music. Musicians loved to play with her – and she adored them. It was true sympatico. Although she did have her moods…. Ruby would be the first to admit she was no angel. I’ve spoken to a few people in the past week who are devastated to learn of her passing because they were in the middle of a fight with her. Who wasn’t? We’ve all had our run-ins with Ruby. I didn’t speak to her for a whole year – over some stupid, pointless thing. But it never lasted forever. They were just flash fires. She was bigger than that. Ruby Carter was a passionate, opinionated, tender, crabby, adorable, infuriating, talented, loving woman – who never forgot your birthday, or your kids’ birthdays, or to call you on Hogmanay or to yell out praise for your solo. I can’t believe she’s gone, but she will not be forgotten. 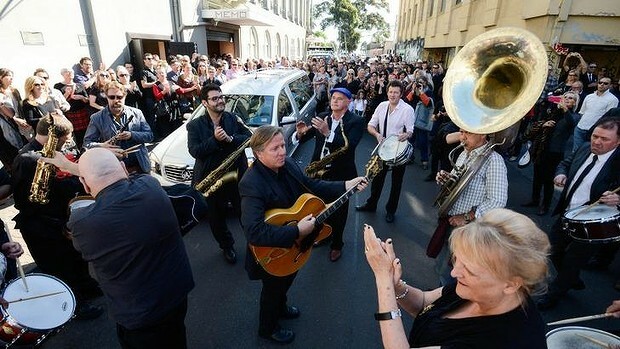 This is the video of the jazz parade send off to Ruby's hearse in Acland street after the ceremony. Acland st 4pm today see how the jazz world farewelled mother Ruby. Everyone spilled out onto the street that was blocked off. The hearse was allowed through....just.